Yehuda Rebbe, the quiet observer, steps up to the first base of my mind and corrects me before I even tell the story. “She says Turkey, and indeed we found the update on Turkey there in the taxi – but mostly we found istanbul! the true goings-on that is, via our taxi man.” Happy that he has corrected my title, he bows towards me, indicating that I should proceed with the ring-like motion of his wrist. As we exited Istanbul’s Atatürk airport to the usual chaos, I saw M. visibly (Hacıvad Bey says “viscerally”) relax, take a deep breath and smile widely. “The recognition of a set of familiarities, a comfort,” I thought, “that’s what I’m seeing in him now.” Esma the hippie puppet agreed with me – she is sensitive to these things, an avid observer of body language and subtly expressed emotions. She, unlike the rest of the Karagöz puppet troupe, was sitting front-and-center on my left shoulder in order to witness everything possible during the return to her homeland. Besides Yehuda Rebbe, who hovered on my right shoulder, the rest of the puppets were stowed away various places throughout our baggage, curled up in the exhausted sleep of jet lag obtained before a final destination. Yes, you can take that as an “our flight was delayed and trying.”It’s a good thing those figments of my imagination don’t weigh anything, those Karagöz puppets, as we humans didn’t have the luxury of jet lag hibernation while lugging our carry on-only baggage around. I’m getting better and better at packing lighter, but have a ways to go. But back to the taxi. As the gaggle of taxi directing men garbled away in their guttural slang, diluted only by the neon yellow of their reflective garb in the dark blue of dusk on pavement, M. shepherded us through their calls of “evala” (“there it is”) and “buyrun canım, gel gel” (come here, dear, come come”) to the tiny canary yellow taxis darting here and there in an impossible jumble. “It’s a wonder more feet aren’t lost,” I hear Kenne, the Queen of Manners mumble as she emerges from exhaustion to find a way to orchestrate an etiquette-driven arrival. “She’s right,” I noted, as I observed the non-Turks standing wide-eyed and confused as the Turks bum-rushed the taxis in their own manner. Before we could comment further, we were sliding across the back seat of a battered old cab, with M. greeting the taxi man with the respectful “kolay gelsin” (“may your work go well”). It’s a way to be respectful when interrupting a working person, as near as this American can tell. It is clearly an offer of respect and kindness. I immediately saw the glint of glee in M.s eyes as he began a conversation. I see these taxi man conversations of his as a pulse-taking that M. enjoys tremendously whenever he returns. Now that my Turkish (or rather still “Turklish”) is a tiny bit better and I can catch more bits of the conversation. M.’s conversations with his taxi men always begin with mutual complaining about the insane traffic present in Istanbul pretty much most hours of the day – not surprising given the massive population growth over the 29 years or so that M. has lived away. The city that was home to 7 million people then is home to 17 million now, so the traffic problem is no surprise. M. speaks lovingly about the days of the dolmuş or shared minibus – that still exist, but not as much. Clearly, this driver shares M.s nostalgia. We learn that his twin sons have just returned from army duty (lucky family) and that he supported the Gezi parkı movement. He is no fan of the başbakan (prime minister). Soon we are hurtling down the hills of Şişli towards Fulya and the home of G., our abla (big sister, but it’s a bit old fashioned and maybe m. Is older than she – but she’s mine for sure. Our stay is fleeting – less than 24 hours sees us back in a taxi on the way to Kibris for a long delayed and much needed vacation despite my swollen liver and pain from each bump in the road. Distraction being 9/10ths of survival for me these days, I begin my usual observation of M.’s latest taxi man téte-a-téte. The latest traffic-related innovation, we learned from this veteran driver, is a radio station just for taxi drivers. Traffic data is sourced by taxi drivers themselves, a brilliant use of crowdsourcing. Indeed, our driver called in a total of three times during the hour and a half it took us to get home through miserable gridlock – despite use of illegal back roads (constructions sites by newly built canals). My mind wandered off to an event years ago in a Bronx arraignments cell, where a new legal client was threatening to cut his carotid artery with a sliver of plexiglass. It was 2 am and I was the lucky social worker on duty sent in to handle it as best I could until the medics arrived with a Haldol injection. I’m well-trained doing suicide interventions with distraught prisoners, but I doubt I would have been any use with a translator on that bridge had I been there. “Life is difficult here,” I surmised, “the traffic is maddening – it might drive someone to that. Along with the blindingly obvious inequality and poor living conditions of many. But just as the radio announcer moved on to the latest traffic report, so too did the conversation turn to happy family matters, where to find good sahlep and so on. And as we exited the taxi, we moved on towards our hopes for a happy vacation that will hopefully be as pain free as possible for me. And so the world turns, and there you have it,today’s Turkey in a taxi. 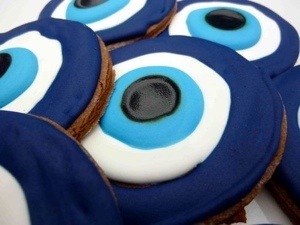 Given this state of affairs, I pinned a nazar boncuğu (evil eye amulet) to my vest, and hopped on the plane…wondering what the Cypriot taxis will bring! This entry was posted in Puppets on the move around the world, Visits from the Karagöz puppets and tagged airport, homeland, istanbul, istanbul traffic, taxi, taxi driver, Turkey. Bookmark the permalink. . . ever the best and most reliable source of opinionated news/info the world over – and good for getting you to your destination as long as you know the way! Happy, restful hols. The last time we got in an Istanbul taxi (from Ataturk Airport to the city), our driver stopped the car in the middle of the highway and ran towards the Byzantine walls to relieve himself. It was surreal. Have a safe trip to Kibris. Oi! That IS quite a surreal story – yet I can totally imagine it! There should be a short story compendium of Ist airport-city stories!!!!! A good assessment indeed & thanks!! !